This month, I felt particularly on-brand, as I found myself sitting at London Heathrow debating whether to get on my flight or go to the emergency room. With an opening like that, you’re probably expecting me to confess that this month was disastrous, but the opposite is, in fact, true. January has been another wonderful month and I ended it in one of my favourite places in the world. I welcomed 2019 into my life at home with my family, dutifully ensuring my New Year’s Eve was the most boring night of my year. Much of the first half of January was spent in a catastrophic whirlwind, seeing me trip planning, trip cancelling, heading to the hospital, the doctors, the pharmacy, and failing the one and only New Year’s resolution I had set for myself. To not take a single course of antibiotics this year. How long did I last? My immune system is the best. Not what you want to see when you’ve been battling acute sinusitis for four months and are about to get on a plane to Delhi. Safe breathing levels, by the way, are around 20. Not, for example, 996. Something Dave and I have in common is our strong disliking of cold weather, so once the holiday season was done and dusted, we jumped on a plane bound for Bangkok. Within minutes of stepping off the plane, I felt warm and content. Heading to warmer climates is a decision I expect to make for all of my future Januarys. We spent a night at our favourite airport hotel beside Don Mueang — lol, you know you’ve visited a country often when you have favourite airport hotel — then set off for a morning flight to Trang the following day. You guys already know I adore island-hopping in Thailand, and I try to hit up new destinations during every visit. I’d read that the Trang islands weren’t as visited as the big hitters in Thai tourism, but that they still offered decent infrastructure for travellers as well as some seriously glorious beaches. Dave and I decided to spend two weeks seeing what they have to offer. Our first island was Koh Ngai. We were staying at Koh Ngai Cliff Beach Resort — the only place on the island to have a pool, and I have to confess that the pool had been the main selling point for me. Having such a spectacular view to wake up to was incredible, and the resort itself was lovely. The Trang islands are fairly overpriced relative to the rest of Thailand, but I wasn’t mad at spending $90 a night for one of the best viewpoints in the country. But there was more to Koh Ngai than our swimming pool, as hard as it was to drag ourselves away from it. The beach in particular, was breathtaking, and we walked the length of it every morning. For such a compact island, Koh Ngai was more developed than somewhere like Koh Wai, which I visited last year, and I delighted in having so many restaurants and bars to choose from. After a morning spent padding across the soft white sand, I’d usually grab myself a Penang curry and cold beer from one of the resorts and watch the longtails cruise in and out. Afternoons were for reading beside the pool, and my evenings were all about drinking the night away beneath the stars. Shout out to Coco Cottage for serving the best pina coladas I’ve ever had! Koh Mook from the water. I felt as though I was in the Caribbean with all of those palm trees waiting to greet me! From Koh Ngai, we longtailed over to Koh Mook, which fast became my favourite island in Thailand. I know — every time I visit this country, I come away with a new favourite, but guys, Koh Mook is incredible. I adore this island so much. We were staying on that beach pictured above, in a wonderful guesthouse with an adorable owner who brought us fresh fruit every morning. Beside us was a small village filled with great restaurants, friendly locals, and the quietest reggae bar I’ve ever stumbled into. We quickly settled into a routine for our five days on the island: there was the small bakery with the incredible fresh bread, the kickass restaurant Sugars that we visited multiple times a day, and the local smoothie lady, who began preparing her coconuts whenever she saw Dave coming. Ahem. 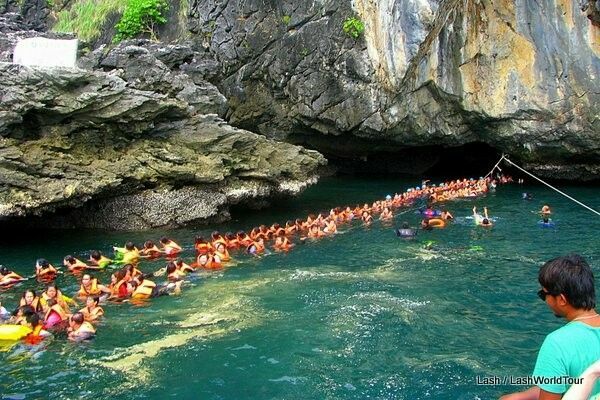 Koh Mook is most famous for being home to the epic Emerald Cave. You get there by jumping into the sea, swimming through a long, dark cave with a flashlight, and then eventually emerging into a scene that’s hard to believe is real. There’s a pristine beach, a small turquoise pool and, if you time it right, hardly anybody there. Time it wrong? In that case, the entrance to the Emerald Cave looks something like this. It was one of the coolest experiences I’ve ever had in Thailand, and if you’re staying on Koh Mook, rather than taking a day trip, it makes it far easier to visit when the crowds have dissipated. Finally: Koh Kradan, which easily is the prettiest island in Trang province. It’s home to one of the most incredible beaches I’ve ever stepped foot on! You can probably see from my photo that the people in the distance are only up to their thighs. We only had a day on Kradan, as the accommodation options are fairly dire, but I loved paddling in the warm water, taking 420 photos of the exact same scene, and having some serious discussions with Dave about whether we should go nomadic again. If you’re looking for a picture-perfect beach in Thailand without too many crowds, Koh Kradan is the place to be. Bangkok, Bristol, Koh Kradan, Koh Mook, Koh Ngai, London, Trang. Koh Kradan is also home to some incredible snorkelling! I’d say it even rivalled the Great Barrier Reef. A magical entrance to the Emerald Cave: One of the most incredible moments of my life was emerging from the Emerald Cave and on to the perfect beach. When I made it half-way through the cave, I could see a small beam of light ahead of me, so switched off my flashlight to get the full effect. I swam around a corner and ahead of me was one of the most incredible sights. There were three people on the beach, standing motionless in silence, watching me paddle towards them. The closer I got, the more I could see of the towering cliffs and beautiful sand. It felt as though I was in a movie as I emerged into this amazing spot in silence. I was convinced I’d despise the Emerald Cave because I’d seen nothing but photos of crowds when researching. Funnily enough, it ended up being the highlight from my entire trip to Thailand. It always seems to work out that way. Expertly avoiding jetlag: The older I become, the more I seem to struggle with jetlag. Last year, a flight from Rome to Tokyo had me barely able to function for a solid ten days after arriving in Japan. I was therefore prepared to feel like death in Thailand. Somehow, though, I managed to entirely avoid all symptoms of jetlag. I felt fantastic from day one of my trip! How did I do it? Phenergan! I started taking it when I was sailing around Greece a few years ago, as my doctor told me it was excellent for nausea. It was, and an added side benefit was experiencing the best sleep of my life every night. I saved the leftover tablets and decided to take one once evening fell in Bangkok. I slept hard, then woke the following morning feeling refreshed. Suddenly, I had acclimatised to my new time zone and that was all it took. It may have been a fluke, but from now on, I’m considering Phenergan my new travel essential. A taste of luxury on Koh Ngai: Yeah, I really loved that view from the pool. Delaying yet another trip to India: It’s no secret that I’m working on my health at the moment. Years of travel, food poisoning, and frequent antibiotic use has left my immune system in tatters and I’m currently spending my life permanently unwell. So, granted, planning a trip to India probably wasn’t the smartest idea I’ve ever had. Stomach issues combined with a poorly-functioning immune system combined with a four-months-and-counting bout of sinusitis combined with a newly-arisen Eustachian tube dysfunction combined with chronic pain… and I was supposed to be getting on a plane to India? India: where the air pollution was currently cancerous and I was likely to get Delhi Belly? Oh, and then throw in my delayed planning that left me with night trains as my only transportation option through Rajasthan, which was something I’d read wasn’t safe for solo women. I got spooked, I freaked out, and cancelled my trip. I cancelled my trip while I was at the airport. Ugh! I was in too much pain to get on the plane. But the good news is that I planned out an epic adventure in Rajasthan and I’ve got everything still bookmarked — I’m hoping I’ll be able to take this trip towards the end of the year instead, when my body will hopefully be in much better shape. Our hotel’s longtail sank on Koh Ngai! A gecko shat on my face: It was early in the morning on Koh Mook and I was reading a book on my balcony. When I looked up at one point, I spotted Dave walking towards our guesthouse and waved. Suddenly, something warm and wet was dribbling down my forehead. I gasped and immediately covered my head. I shouted down to Dave. I glanced skywards and noticed a gecko hanging out in the rafters above my head. Man alive! I brushed my teeth with antiseptic cream: I don’t know how it happened, but I do know that it was dark in our room in Koh Mook, and that both the toothpaste and antiseptic cream were in 100 ml white tubes. So I guess I do know how it happened. I squeezed the cream out on to my toothpaste, grabbed a bottle of water from the fridge, and began to brush. At first, I was like, wow! Cold water really transforms the taste of toothpaste! It tastes so…. like… um… what is that flavour? My biggest revelation from the entire incident is that antiseptic cream doesn’t taste all that bad! Dave did complain that my breath smelt like hospitals the next morning, though. Coming up next: even more travel! I’ll be continuing my Thailand adventure by hitting up yet another brand new island for me: the super-quiet Koh Libong! Libong is known for being incredibly low-key and underdeveloped. It’s also known for being home to the rare dugong! We’re going to be spending our time there lounging in hammocks, exploring the island on two wheels, and hopefully heading out to spot a happy dugong in the wild. After a quick jaunt to Phuket, that’ll be it for my Southeast Asia travels for now, and I’ll be mixing things up by flying out to Qatar for the first time. When the cheapest flights back to the U.K. went via Doha and I realised I could layover it up for no additional charge, I immediately planned for three action-packed days in the country. On top of that, I managed to score an incredible deal on a 5-star hotel (60% off! ), so this will be a real departure from my typical budget travels. As for what I’ll be doing in the country? I plan on spending time exploring Doha and then heading into the north to gain a taster of the country outside of the glitz and glam of the capital. Once I get back to Bristol, it’ll be time to sit down and get some writing done. For the rest of the month, my life is going to be all about staying healthy, working on healing my ever-present illnesses, and catching up on work. I feel your NYE pain, so to speak. It was the first time we had NYE plans in years (my oldest is six, so it’s been around 7 years since I’ve done anything on New year’s eve). Naturally, I got (really) sick while we were in the US visiting family. Of course, my daughter came down with it while we were flying home on the 30th. I went to sleep before 10 pm. I think one reason I relate so much to you: all your mystery illnesses. I wasn’t diagnosed with celiac until I was 31 and I was a mess from about 16 on regarding mystery problems with my body. Also, I had mystery problems last year (unrelated to celiac), which have just as mysteriously cleared up. Thankfully. I admire that you travel anyway, if the pain isn’t too debilitating. yup. +1 about Ko Mook. had a horrid grey ferry from Ko Lanta to Ko Mook, via Ko Ngai, dropping people off, and then had to hire a long tail from ferry pier at charlie beach to the east side. As soon as we went around the corner and saw the white sand beaches, the sun came out too! Would share a video, but my phone camera glass broke. and to add to it all, i fell in the water doing a jumping exit from the longtail. Ko Libong is worth a trip to as well. That air quality stat is horrific!! I don’t blame you for not going. I keep wanting to go back to Thailand so badly, and all of those islands look amazing! We stayed on a very similar beach on Koh Phangan of all places (probably goes without saying that it was the other end from the full moon party), where I have a picture of myself ankle-deep miles out from the shore. And people in the distance thigh deep! It was unreal. We are in Rajasthan atm. First time visit. Fabulous. Hope you make it out here. Oh, me too! I was excited to spend three weeks there, too. Fingers crossed I can head that way at some point this year. Let try you next trip in Paxos. Paxos is one of iconic place where you can spend this holiday with your family/ beloved ones.This place is just like the heaven on the earth . Away from the bustling masses of other, more touristic Greek islands, Paxos is a destination for those seeking harmony and tranquility together with an easygoing day-to-day and stunning seaside sceneries. This small island of the Ionian Sea is full of olive and pine trees, secluded beaches, breathtaking underwater caves and postcard-worthy sceneries. Just live the experience of the colorful pebbled shores, dramatic white cliffs, verdant groves and crystalline azure waters; thousands of colours, and then, a thousand more as the sun begins to set, transforming everything with its last fiery rays. Hi, I am hoping you can help me. We are 4 girlfriends in our late 30’s traveling to Thailand on 23 August. We will arrive in Bangkok the evening and then want to go to an island for 7 nights. We don’t like backpacker vibes. We love beautiful clean beaches and love swimming in the sea as well as snorkeling. At night we would like to have sundowners and go to cute little restaurants. Initially We considered Koh Lipe but from forums I read that weather can be bad and that it takes very long to get there. When we check out on the 1st of September we have to leave the island and be at Bangkok airport by 6pm. The other option was Koh Lanta but I am also worried about the weather. Where do you recommend we go given we only have 7 nights and what we like? You can fly into and out of Trat from Bangkok, where you can catch a ferry to either island, or you can take a minivan to save money. I’m not a huge fan of Koh Lipe as it’s super packed with tourists these days. Koh Lanta could be good, although the beaches aren’t as nice and clean as the islands I mentioned above.